We are all made for relationships. Each person lives day-to-day relating with other people. And of all relationships, knowing God is most important. But because of our sin, our relationships are all damaged and need repair. Fortunately, God is in the business of creating relationships that are compelling by drawing people into his church. The church consists of those who have entered a relationship with God through faith in Jesus Christ and direct their lives according to his Word. In this community, we worship God together, we grow in our faith together, and we serve others together. As these compelling relationships are nurtured, the Holy Spirit uses the church to have a dramatic impact on the world around it. As a church, we aspire to be this kind of community. We want to be an environment where people are growing compelling relationships with God and others that have an irresistible influence in our world. That’s why at Fellowship, it’s always personal. 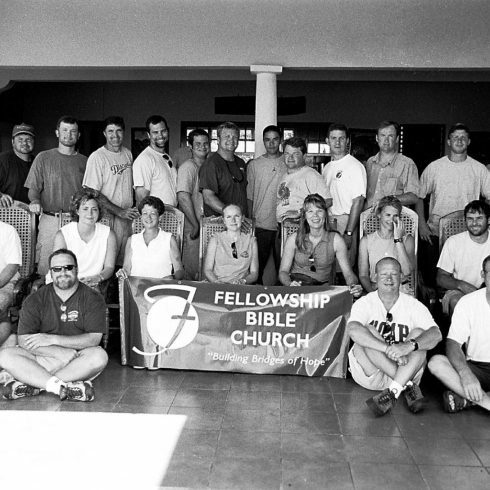 In the spring of 2001, a small group of believ­ers was exposed to the phe­nom­e­nal min­istry of Fel­low­ship Bible Church in Lit­tle Rock, AR. After attend­ing a con­fer­ence spon­sored by Fel­low­ship, the group com­mit­ted them­selves to build a church of irre­sistible influ­ence here in Jackson, TN. Step­ping out in faith, they hired staff and began lay­ing the ground­work for what would become Fel­low­ship Bible Church of Jack­son, Ten­nessee. The church was char­tered on June 3, 2001, and the first pub­lic wor­ship ser­vice was launched at a local school on September 23, 2001. Fellowship’s expe­ri­ence has hardly been ordi­nary. From the incep­tion we have enjoyed con­stant growth which has accel­er­ated in recent years. In 2007, we left our portable his­tory behind and relo­cated to our cam­pus on Pleas­ant Plains Road. This move expanded min­istry oppor­tu­ni­ties and gave the church addi­tional pres­ence in the com­mu­nity. In 2017, we launched our South Campus, with the goal of further expanding our ministry and reaching the unchurched. We are a regional church that draws mem­bers from sur­round­ing coun­ties and sends mem­bers across the globe. We are still a young church and we believe that much of our his­tory is yet to be told. There is but one living and true God, who is one in essence, while eternally existing in three distinct persons: Father, Son, and Holy Spirit. Though each person of the Godhead possesses one and the same nature, each functions differently in respect to God’s dealings with man. The Father orders and directs all things according to His own purpose, pleasure, and grace. He has decreed all things that come to pass for His own glory. He graciously involves Himself in the affairs of men, hears and answers prayer, and saves from sin and death all who come to Him through Jesus Christ. Jesus Christ is both the eternal Son of God and virgin-born Son of man. Fully God and fully man, He surrendered nothing of His deity during His earthly life. Having led a sinless life, He satisfied the Father’s justice concerning sin by His death. Bodily resurrected to life, He ascended into heaven and is the only mediator between mankind and God. The Holy Spirit manifests the presence of God as He executes His will in the world. He convicts the world of sin, and persuades people to repent of their sins and confess Jesus as Lord. By the same Spirit, all believers are given new life through regeneration, empowered and gifted to live righteously, and enabled to persevere in their faith until the final day. The Scriptures of both the Old and New Testaments are verbally inspired of God, error-free in the original writings, and the supreme authority of faith and practice for the believer in Jesus Christ. The Scriptures are rightly understood when interpreted according to the historical-grammatical method, in order to determine the author’s original, intended meaning. Man was created, as male and female, in the image of God to glorify Him and enjoy His fellowship forever. Man fell into sin by a voluntary act of personal disobedience to the will of God; consequently all of mankind are born sinners, alienated from God and corrupted in every aspect of their being. This depravity condemns everyone to both physical and spiritual death apart from Jesus Christ. Salvation is found in Jesus alone. None can accomplish salvation according to his own merit but receive it only by God’s grace through faith. Those who believe in Jesus for salvation are declared justified by the Father and regenerated by the Holy Spirit. The Christian is adopted as a child of God forever and granted an eternal inheritance. The next great event of human history will be the personal return of Jesus Christ. This blessed event will coincide with the bodily resurrection of the dead and usher in the final judgment and the consummation of God’s redemptive work. Though the time of Christ’s return is a mystery known only to the Father, it is the great hope for all those who love Him. All who have been regenerated by the Holy Spirit belong to the one true church and are directed by the Scriptures to associate themselves in local, visible churches. The gospel message and mission distinguish the local church. The mission of the church is to prepare for Jesus’ return by leading people to Christ and helping them mature in the faith. According to the example and instruction of Scripture, a plurality of elders is to govern the church. The elders are to seek the mind of Christ, who is the Head of the Church, through the guidance of the Holy Spirit and the Word of God. They must be able to exhort the church in sound doctrine and refute those who contradict the truth. Pervasive, sinful conduct is harmful, wrecking the wayward person and eroding the unity of the local church. Consequently, the church is required by Scripture to confront lawlessness and pursue restoration. Church restoration is never punitive but is rather an effort to encourage every professing believer in righteousness. This statement of faith is not the totality of our convictions regarding truth, morality, or right conduct. The Bible, as the inspired and infallible Word of God, is the absolute and final source of all we believe. The board of elders serves Fellowship Bible Church as the interpretive authority on the Bible’s meaning and application. Baptism is the immersion of a believer in water as a visual and symbolic demonstration of his union with Christ in the likeness of His death, burial, and resurrection. The act of baptism has no power to save but vividly depicts a person’s release from the mastery of sin. As with baptism, the Lord’s Supper is to be observed by those who personally know Jesus as Savior. This ordinance symbolizes the breaking of Christ’s body and shedding of His blood on our behalf and is to be observed regularly in remembrance of Christ’s finished work. From creation God wonderfully made man and woman to be sexually distinct from one another and complementary to one another. Through marriage, a man and a woman are united in an exclusive, lifelong covenant with each other. Marriage is a gift from God that is intended to mirror the union of Christ and His church.